Agilent Technologies has announced the inclusion of faster PC hardware in the Infiniium 90000 Series oscilloscope family. 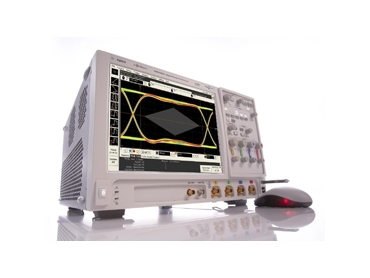 These award-winning, high-performance, real-time oscilloscopes are very responsive. Engineers designing high-speed serial data links such as USB, SATA or PCI Express rely on high-performance oscilloscopes to measure jitter and other signal parameters. Complex analysis is often critical but can be time consuming to execute. For example, a jitter separation algorithm can take more than 30 seconds to run on competitive scopes using 20 Mpts of memory. With the new performance enhancements, the Infiniium 90000 Series scopes yield results in less than 2 seconds. This performance, combined with the industry-leading 1 Gpts of memory offered in the Infiniium 90000 Series, enables developers to quickly document results of their design performance across a wider range of test conditions. Oscilloscopes also need processing power to remain responsive when manipulating complex algorithms such as de-embedding algorithms. This improved responsiveness allows engineers to account for the effects of channels, probes and fixtures on high-speed signals. Agilent's InfiniiSim waveform transformation software (N5465A), which also uses hardware acceleration, takes advantage of the new performance enhancements to provide superior waveform update rates for measurements that use de-embedding algorithms. The new performance enhancements come standard at no additional cost on all new Infiniium 90000 Series Oscilloscopes.